PRDnationwide Whitsunday — Welcome To The Whitsundays - Island Time — Whose House Is That? The most talked about and asked about house is the Tuscany house on the point at Mandalay. The house sits on one acre and is rumoured to have cost north of $20 million to build. It is owned by Neil and Denise Murray, who are now more passive investors; however they played a significant part in the Australian boating industry with their ownership of both Princess Yacht and later Sunseeker yachts. The home has its own marina. This house forms part of the old Mandalay Coral Gardens – previously a five acre waterfront property where dive training was available (this is where I got my ticket), and where my former real estate partner Bruce Goddard started the area's first bareboat charter business with a 23-foot Hood in the late 70s. 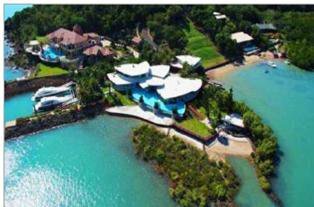 Above the Coral Sea is one of Airlie Beach's most expensive homes owned by John Longhurst. John paid $10.3 million for the land and then was rumoured to have spent something similar on the home. John developed Dreamworld and has held an interest in the Logan Hyperdome during most of his business career. His son Tony is known for his racing car ability. One of the area's largest residential properties is a 3,000 acre parcel just north of Airlie Beach known as Woodwark Bay. This site was owned by Japanese development company Kumigiami and had a previous approval for approximately 10,000 houses and units. In the late 90s, it was purchased by Jodi Rich of One.Tel and now has a magnificent home and a small number of waterfront bungalows, which are available for holiday stays. Many of you may remember the wonderful gift of life Kerry Packer's helicopter pilot Nick Ross gave to Kerry by donating one of his kidneys. Nick lives in the hinterland. Another really interesting property is Australia's only airpark - Wave. This is the mainland's coastal airport and is improved with about 80 residential lots accessed off the runway where an owner can land their plane and drive straight into their hangar and go upstairs to their home. The Whitsundays is an area of diversity - either a beautiful waterfront apartment with your boat at the front on your own marina finger or your home with your jet below.